Access Mode: Presidential Library Internet Portal. Title from the accompanying document. Copying by users is not permitted. 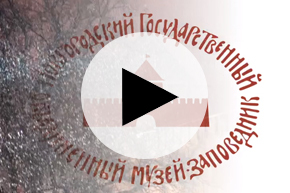 The video tells about the Festival of films about the history and art of Veliky Novgorod. This is a joint project of the Novgorod Museum-Reserve, the Presidential Library named after B.N. Yeltsin (St. Petersburg) and the Novgorod Metropolis of the Russian Orthodox Church. With the blessing of the Metropolitan of Novgorod and the Old Russian Leo, films made by the director of the Presidential Library Tatiana Dyakonova with the participation of specialists from the Novgorod Museum were shown in Veliky Novgorod and four branches of the museum . I. Dyakonova, Tatyana Ivanovna. Ii. Yarosh, Vladimir Mikhailovich. Iii. Presidential Library (St. Petersburg). Iv. Novgorod United Historical-Architectural and Art Museum-Reserve.1. "Festival of films about the history and art of Veliky Novgorod" (Veliky Novgorod, city; 2017) - Multimedia publications. 2. Presidential Library (St. Petersburg, city) - Events - 2017 - Multimedia publications. 3. Novgorod Integrated Historical-Architectural and Art Museum-Reserve - Multimedia publications. 4. The people (collection). 5. Territory (collection). 6. Territory of Russia: Novgorod region (collection). 7. Russian fine art - Veliky Novgorod, city - Multimedia publications. 8. Temples - Graffiti - Veliky Novgorod, the city - Multimedia publications. 9. Veliky Novgorod, City - History - Multimedia publications.